October 2011 marks 10 years of turns-all-year, 120 months of turns-every-month for me. 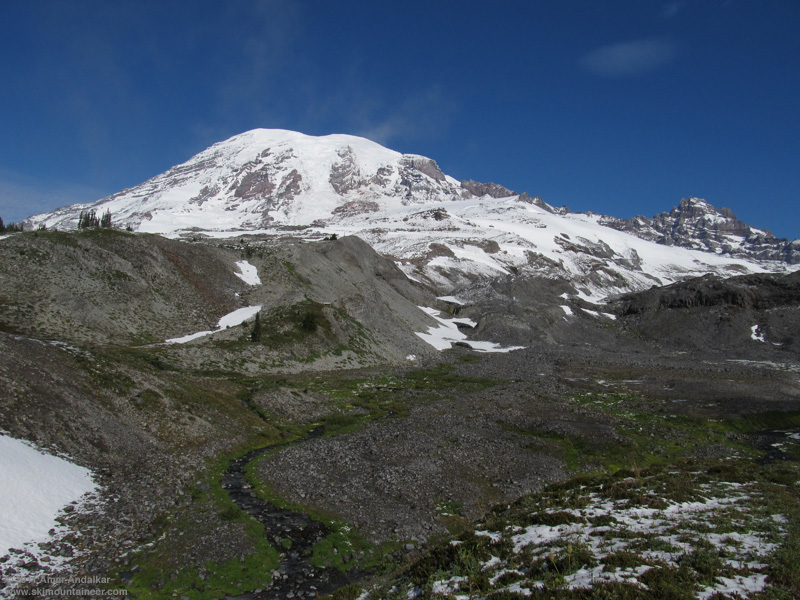 My first two trips of the month were both to my usual default destination of Camp Muir, via the favored early-season or late-season route from 4th Crossing Trail to Paradise Glacier and then crossing over to the Muir Snowfield just below 9000 ft. Yet the two trips were very different despite occurring only 5 days apart, and I thought the comparison and contrast might be interesting for others. 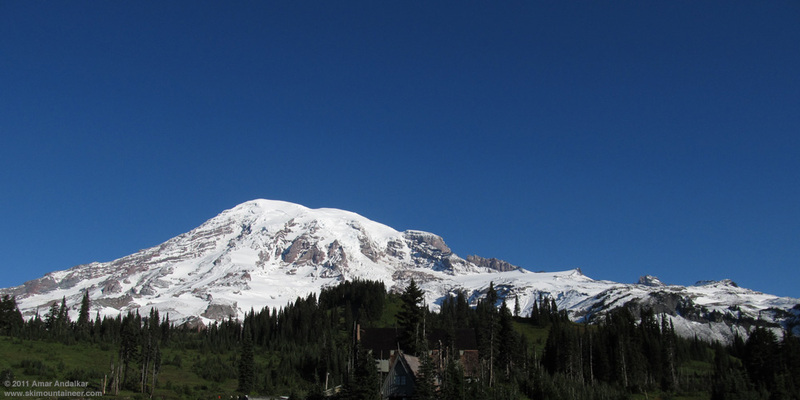 Saturday, October 8: A marginal Rainier forecast ("Saturday: mostly cloudy" had been the wording the previous few days) meant that no trip was planned. But a pre-dawn 5:30am check of the updated forecast (now stating "partly sunny, freezing level 10500 feet") and the UW weather model revealed that the day would probably be quite sunny instead. Hence a last minute decision to head for Muir, then calling and waking several friends around 6am, but ending up solo with no luck in landing a ski partner. And also total solitude for most of the day, on a sunny Saturday no less: I would not see a single other person after passing through the Paradise parking lot to drive down to 4th Crossing, until joining the Muir Snowfield nearly 4 hours later. Left the trailhead just before 10am with everything still hard-frozen in the shadows, but the day quickly warmed under the bright sunshine as I crested Mazama Ridge. It felt like Indian Summer. Thursday, October 13: The Rainier forecast had said "Thursday: mostly sunny" for several previous days, so numerous partners were itching to hit the new snow. My car held 5 this time, and a couple of other cars of TAY regulars at 4th Crossing brought our loosely connected group up to an improbable size of 10. As we headed up around 9:30am, the day started mostly cloudy with a high overcast of rippled clouds, improving slowly to partly sunny and even mostly sunny at times, but temps remained cool. Definitely feeling like early winter. 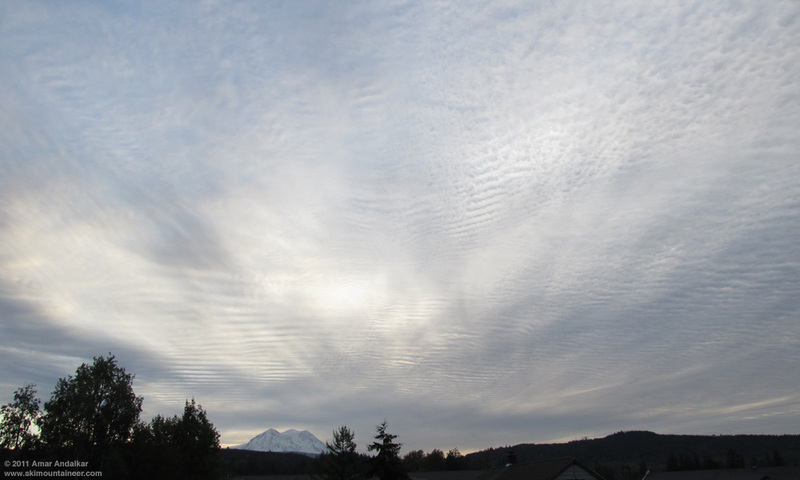 Rainier and rippled overcast seen from Eatonville. 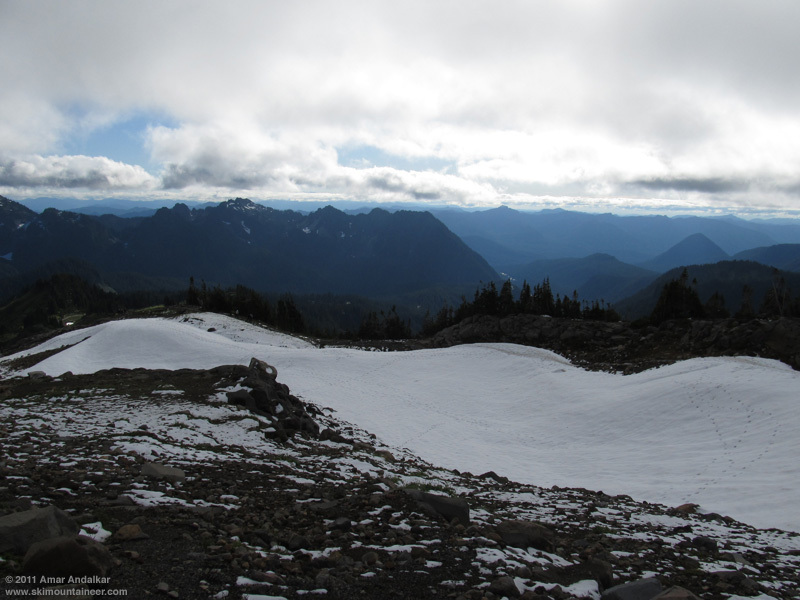 Oct 8: A major storm system over the previous several days had brought heavy snowfall to the Cascades above 6-7000 ft. A bit of snow had even fallen down to Paradise, with 2" of snowfall officially recorded on Oct 6. But other than a few small bits in the trees, new snow remained only atop old snow (which had amazingly survived the summer in very large patches even below 6000 ft). 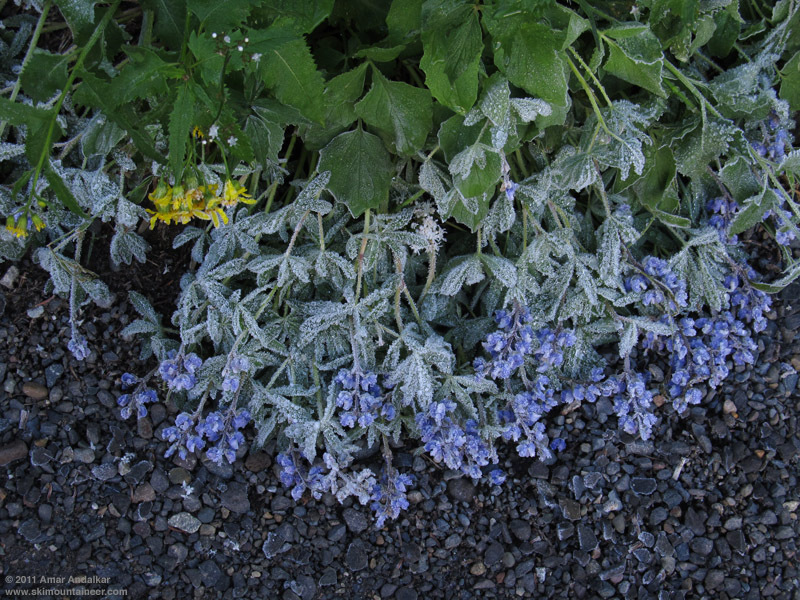 The clear night had created some exceptional needle ice along the trail atop these old patches, and the wildflowers were still looking like late-July form, although now crusted overnight with frozen dew and frost -- quite an amazing overlap of mid-summer flowers and autumnal ice. The first continuous skinnable snow was at 6200 ft, about 1.8 miles from the car. Very thin coverage for a pair of 100-yard sections near 6600 and 6800 ft below the toe of Paradise Glacier, these areas were skinnable with great caution, but would not have been skiable on the descent. 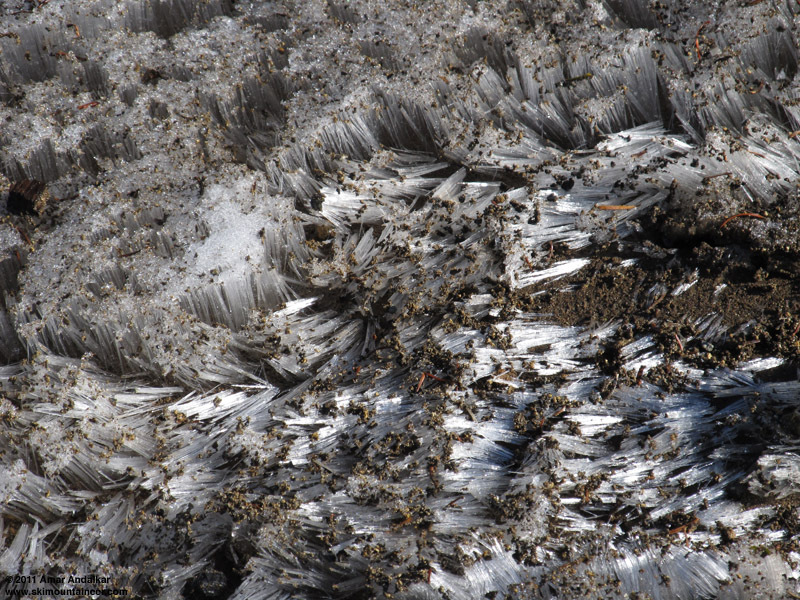 Needle ice crystals, about 1-2" high. The view from Stevens-Van Trump monument at 6000 ft, October 8. Oct 13: Another major storm system over the previous several days had brought more heavy snowfall to the Cascades above 6-7000 ft. A bit of snow had again fallen down to Paradise, with 0.5" of snowfall officially recorded on Oct 12. This time, a dusting of fresh snow remained on many slopes below 6000 ft, and the wildflowers had taken a severe beating compared to 5 days earlier. There was now 4-6" deep continuous skinnable snow at the Stevens-Van Trump monument at 6000 ft, barely a mile from the car. The basin below the toe of Paradise Glacier had much better coverage now, easily skinnable and also continuously skiable on the descent with a bit of caution. The view from Stevens-Van Trump monument at 6000 ft, October 13. We skinned from here. The whole group skinning towards the basin below the toe of Paradise Glacier, with Goat Rocks and Mount Adams in the distance. Oct 8: I followed an old skin track (perhaps from Silas' group on Oct 6) up the Paradise Glacier, partly buried by 1-2" of more recent snow. 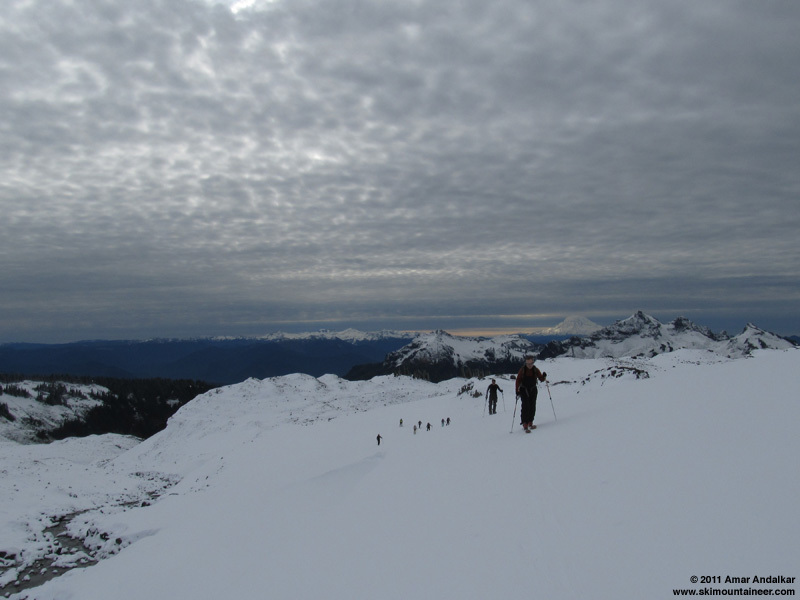 The new snow had rapidly consolidated into proto-corn, providing ideal grippy skinning conditions in the warm sunshine, even up the steep slope at the terminus of the Paradise Glacier. The major crevasse at 8000 ft was crossed by the skin track on a solid but exciting snow bridge, and I chose to follow the track, even though the crevasse could have been end-run by detouring about 200 yards left. 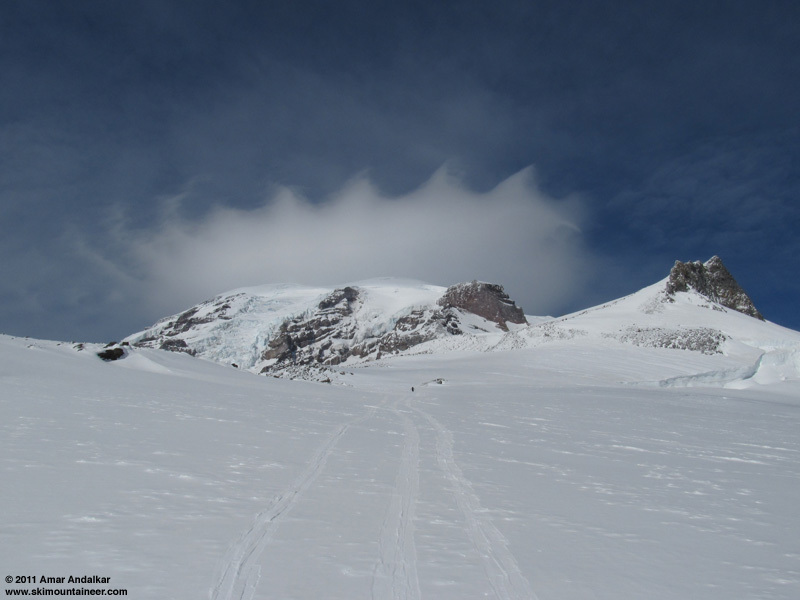 An incipient lenticular cloud was forming atop the summit as I neared the top of Paradise Glacier. The skin track across the snow bridge at 8000 ft, October 8. Incipient lenticular cloud, October 8. Oct 13: A solid rain crust this time on the Paradise Glacier, topped by variable amounts of smooth wind-packed powder ranging from less than an inch to over a foot, a bit slippery for skinning in spots. 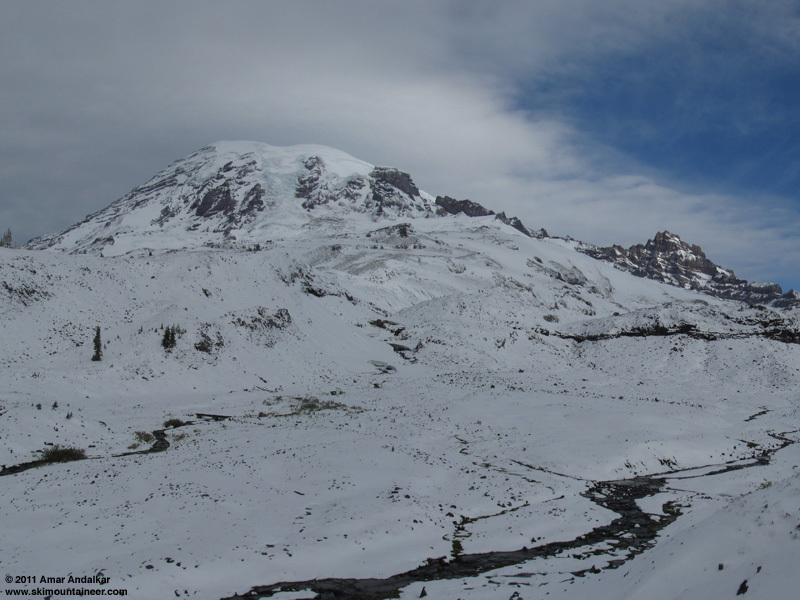 We detoured around to the gentler eastern edge of the glacier, avoiding the steep slope at the terminus. 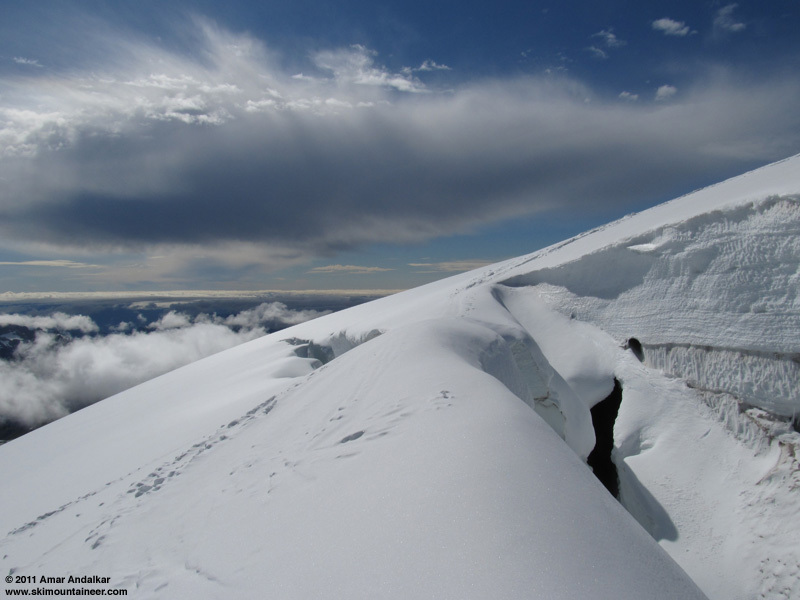 All evidence of previous tracks had vanished, and a new skin track was put in to safely end-run the large crevasse at 8000 ft, well west of the visible opening. A lenticular cloud had formed atop the summit an hour earlier, and for a few brief moments it now grew a spectacular set of "teeth" radiating outward from its margin. Lenticular cloud with marginal teeth, October 13. 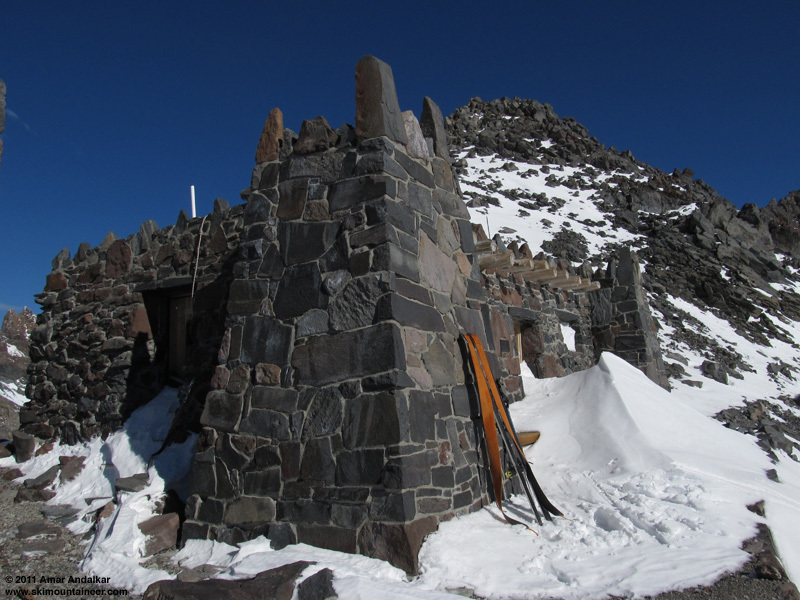 Oct 8: Crossed over to the Muir Snowfield just below 9000 ft and continued on to Camp Muir by 2:30pm. No other tracks of any kind had reached the camp since the most recent snowfall, except for the footsteps of a couple on foot who began descending from near the hut just as I arrived. The camp was sunny and warm if you stayed out of the 20-30 mph breeze, with lots of recent new snow but no evidence of rain. A cloud deck was forming below 8000 ft for the second time this day (an earlier one had formed and dissipated about an hour earlier), so it seemed prudent to change over quickly and head on down. Muir hut ice-free, October 8. Oct 13: Our posse of 10 regrouped at the top of Paradise Glacier, and one carload of three decided to do an extra lap or two on the glacier instead of continuing on to Muir. 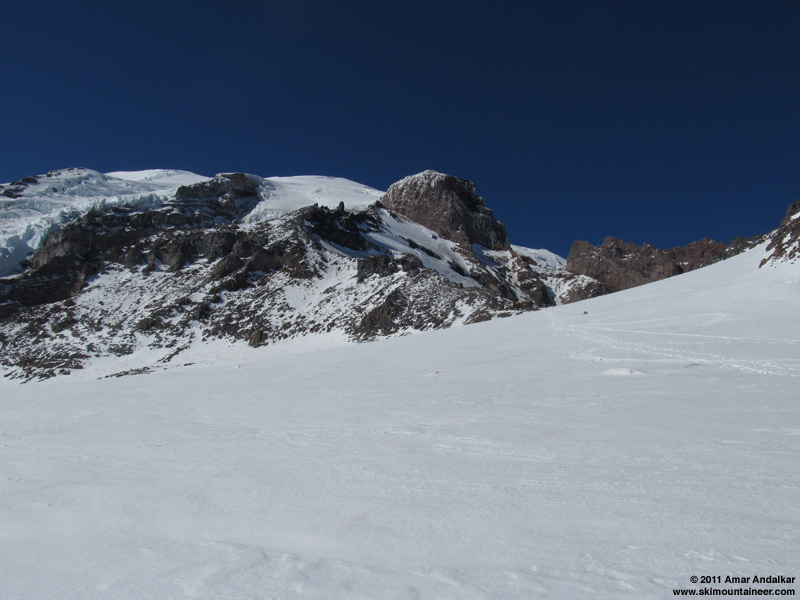 The rest of us crossed over to the Muir Snowfield just below 9000 ft and reached Camp Muir just before 2pm. Several other skiers were already there, a few others had already skied down earlier, and several more were still skinning up -- a much busier day than the preceding Saturday, I guess lots of people have Thursdays off from work. A solid rain crust extended beneath the most recent snow even here at 10080 ft, with lots of water ice coating snow-free portions of the ground and the south side of the hut. Dark clouds were building to the south, but we lingered at Muir for a while, waiting for the rest of our group to catch up. 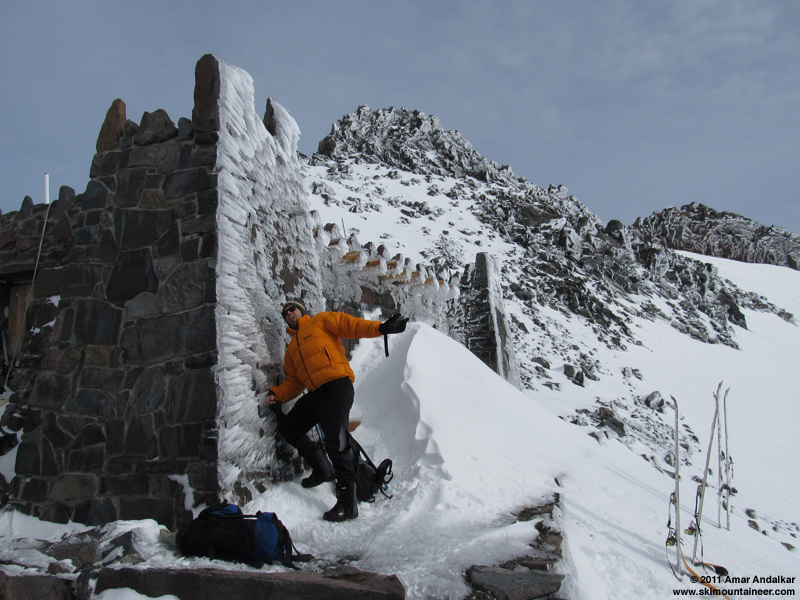 Muir hut with lots of water ice, October 13. Oct 8: Not wanting to risk skiing the crevassed Paradise Glacier solo in a whiteout, I decided to ski the much-safer route via the Muir Snowfield back down to Pebble Creek at 7200 ft, even though I'd be missing about 1000 vert of extra ski descent versus skiing to 6200 ft via the Paradise Glacier. Several other skiers and boarders were still skinning upward as I skied down, on nice smooth windpack (even perhaps becoming proto-corn in places) except for a short stretch of rough 3-6" sastrugi from 9700-9500 ft. I dropped into the cloud deck near 8000 ft, and was glad to have other ski and boot tracks to provide some definition to the snow surface in the whiteout. Only a few more minutes brought me to the end of the skiable snow at around 7250 ft just above Pebble Creek, still solidly within the cloud deck. 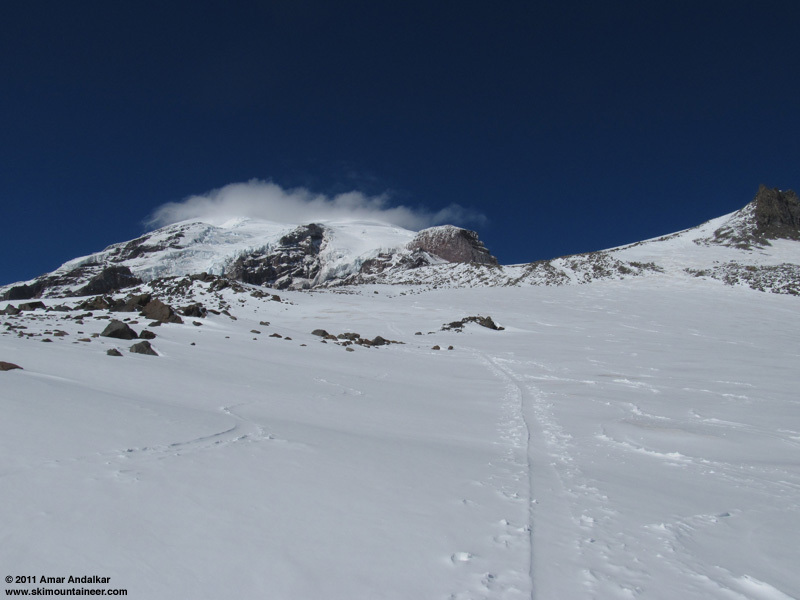 A single set of ski tracks on smooth snow just below Camp Muir, October 8. Whiteout below 8000 ft, October 8. 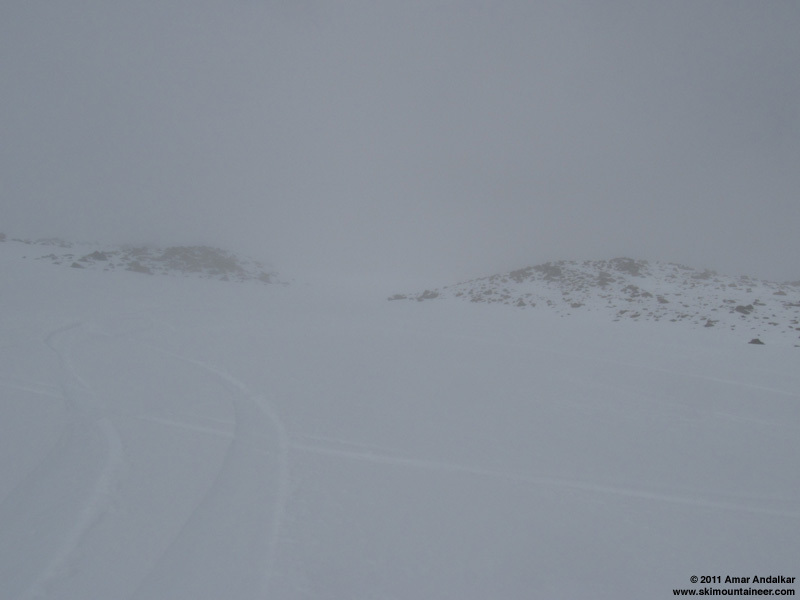 Oct 13: We skied down around 2:30pm, enjoying a fast ride on several inches of smooth windpacked powder, with only an occasional bump of icier rain crust protruding to the surface. 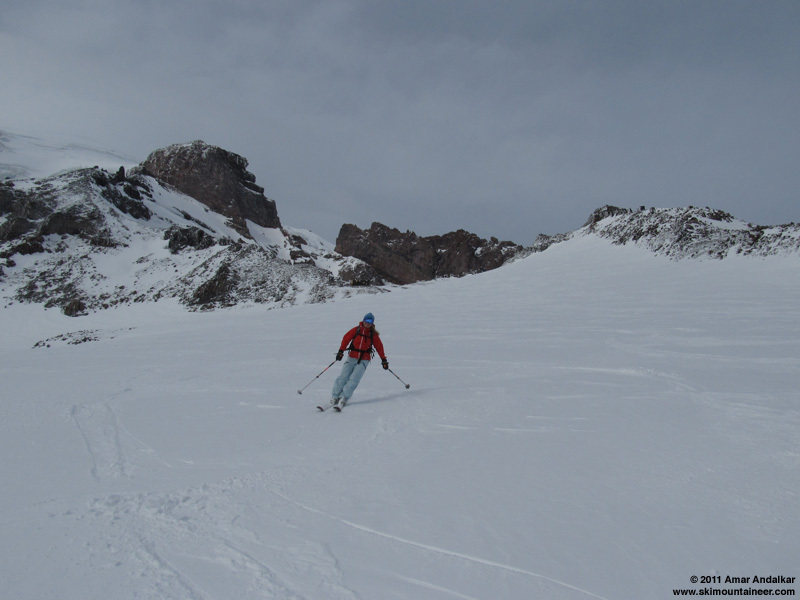 We decided to ski the steep slope beside Anvil Rock, which had filled in nicely compared to how bumpy, scoured, and icy it had looked only 5 days earlier. Mostly sweet turns continued down the Paradise Glacier, as long as you were careful to avoid the icier areas and stick to those which had the most new snow over the rain crust. Perhaps the best snow of the day was down the steep untracked slope at the terminus of the Paradise Glacier, smooth powder atop a firm base. 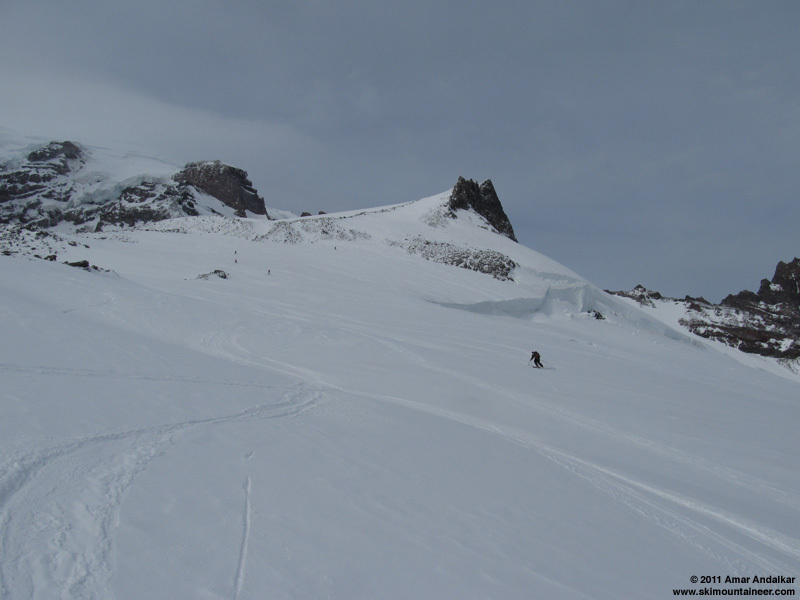 Lots of ski tracks on smooth snow just below Camp Muir, October 13. Dropping past Anvil Rock onto the Paradise Glacier. Sweet turns down the steep terminus of the Paradise Glacier. Oct 8: Having descended via a different route than I'd skinned up due to the incoming cloud deck, there were a couple of choices for getting back to my car. A quick glance at the map confirmed that it would be much easier and faster to just hike the trail back to Paradise and then walk down the road to 4th Crossing, instead of trying to take the High Skyline trail to connect back to the Paradise Glacier side (lots of twists and turns, not very direct). I soon dropped below the cloud deck and back into the sunshine for a pleasant stroll back to the car by 4:30pm. An excellent day of skiing despite the short bit of whiteout, and I was stoked to have completed 10 years of pursuing my year-round passion. Back into the sunshine below the cloud deck, with an extremely unusual large snow patch which has survived the summer near 6000 ft.
Oct 13: We quickly worked through the rocky area below the terminus, it was skiable with caution and sidestepping through one spot. The snow was still wintry and fast on the traverse back to the trail, not much affected by the sun, and even the trail back to Stevens-Van Trump Monument had lost none of its coverage since morning, remaining skiable the whole way with a couple of detours onto snowier patches to avoid the short dips and rises. A solid 4000 vertical foot descent in the first half of October, not bad at all in any year. A quick 20-minute jaunt down the trail brought us back to the cars by 4pm. A great day out on the Mountain, and very nice to enjoy some fine company too this time. Looking back at the Mountain while skiing out the Paradise Glacier trail. SATURDAY...PARTLY SUNNY. FREEZING LEVEL 10500 FEET. SATURDAY NIGHT...RAIN AND SNOW LIKELY IN THE EVENING...THEN RAIN AND SNOW AFTER MIDNIGHT. SNOW LEVEL 8500 FEET. SUNDAY...MOSTLY CLOUDY. A CHANCE OF SHOWERS. SNOW LEVEL 7500 FEET. SUNDAY NIGHT...CLOUDY. FREEZING LEVEL 7500 FEET. COLUMBUS DAY...RAIN AND SNOW. SNOW LEVEL 5500 FEET. MONDAY NIGHT AND TUESDAY...RAIN AND SNOW. SNOW LEVEL 6000 FEET. TUESDAY NIGHT...SHOWERS LIKELY. SNOW LEVEL 5000 FEET. WEDNESDAY AND WEDNESDAY NIGHT...MOSTLY CLOUDY WITH SNOW SHOWERS LIKELY AND A CHANCE OF SHOWERS. SNOW LEVEL 6500 FEET. THURSDAY THROUGH FRIDAY...SHOWERS LIKELY. SNOW LEVEL 7000 FEET. SYNOPSIS...HIGH PRESSURE IS OVER THE REGION BUT CONSIDERABLE HIGH CLOUDS WILL CONTINUE STREAMING INTO THE REGION FROM AN UPPER TROUGH OFFSHORE. A COUPLE OF WEAK WEATHER SYSTEMS WILL BRING CLOUDS BUT PROBABLY LITTLE IF ANY PRECIPITATION FRIDAY THROUGH SUNDAY. THE UPPER RIDGE WILL STRENGTHEN EARLY NEXT WEEK...THEN GIVE WAY TO A FRONT MIDWEEK. THURSDAY...PARTLY SUNNY. FREEZING LEVEL 7000 FEET. THURSDAY NIGHT...MOSTLY CLOUDY. A CHANCE OF SHOWERS AFTER MIDNIGHT. SNOW LEVEL 7000 FEET. FRIDAY AND FRIDAY NIGHT...MOSTLY CLOUDY WITH A CHANCE OF SHOWERS. SNOW LEVEL 6000 FEET. SATURDAY...PARTLY SUNNY. FREEZING LEVEL 6000 FEET. SATURDAY NIGHT THROUGH SUNDAY NIGHT...MOSTLY CLOUDY. FREEZING LEVEL 6500 FEET. MONDAY THROUGH TUESDAY NIGHT...PARTLY CLOUDY. FREEZING LEVEL 9000 FEET MONDAY RISING TO 12000 FEET TUESDAY. WEDNESDAY...MOSTLY CLOUDY WITH A CHANCE OF RAIN. SNOW LEVEL 8000 FEET. I couldn't have said it any better. Glad to hear you had good conditions on Rainier! Congratulations on 10 years Amar! It was fun skiing with you and everybody else. Nice commitment to the sport Amar. I saw you guys dropping below Anvil Rock on my ascent on the 13th and even thought I heard you yelling to someone in your group. 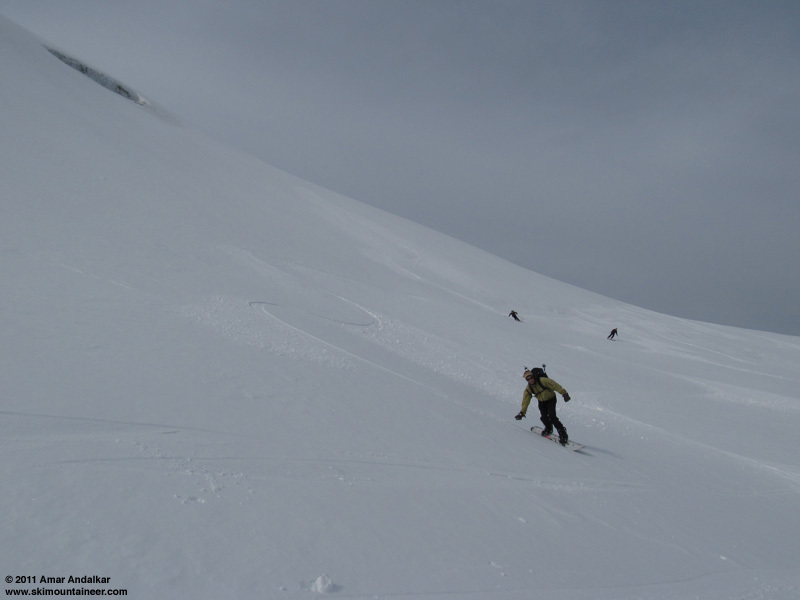 Did those turns just above Muir on the Cowlitz cleaver belong to someone in your group? I think I was yelling back up to the others that it was really good on that slope! Not sure who made the turns on the Cowlitz, but they were already made when we reached Muir. I noticed the cloud also. I believe that is a Lisa Simpsonimbus. Nice to meet you again, Amar. Congrats for the numbers and thanks for all the TRs. Congrats on 10 years! Looks like decent conditions too for early October! congratulations on your first - and prost to your next ten solar orbits of year round skiing! Nice commitment to the sport Amar.� I saw you guys dropping below Anvil Rock on my ascent on the 13th and even thought I heard you yelling to someone in your group.� Did those turns just above Muir on the Cowlitz cleaver belong to someone in your group? Good one....Keep the flow going....I hit five, but ten is quite the number! Kevino says I was auditioning for TGR??? Not so......producing my own films with Gett Some Gettman! Kaboom! Ten well documented years. Awesome Amar, and thank you for the quality you bring to this site. 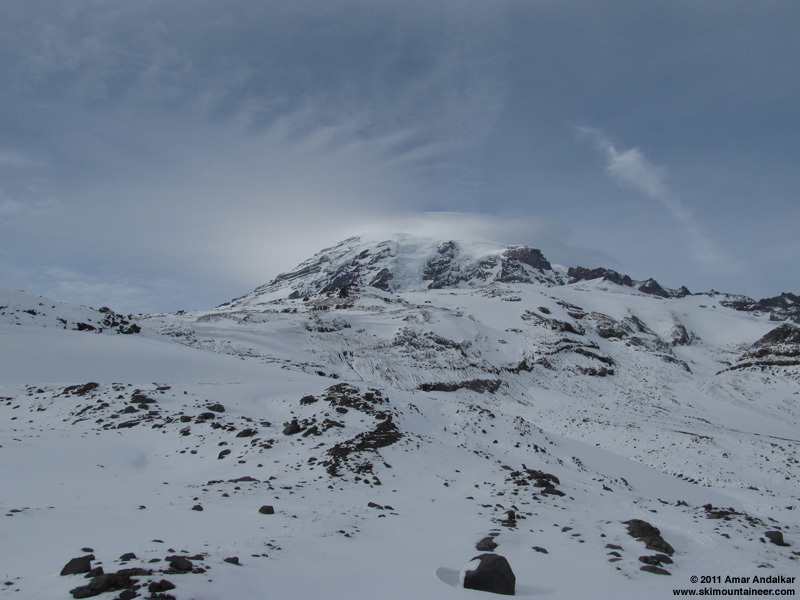 One of the most amazing stories, was your night of survival on the crest of Rainier. You huddled next to a steam vent in a snow cave, if I recall. And the innocuous beginning to the ordeal of losing sight of your partner... and probably passing unseen in fog looking for one another. Simple stuff with big consequences. Keep the reports and photos coming. Ten more years. Thanks for the info on the Paradise Glacier route. Where is the fourth crossing you mention? Never have skied the Paradise Glacier, and would like to. The 4th Crossing Trail begins along the Paradise Valley Road about 0.6 miles east of the main Paradise parking lot. Just continue straight along the road past the parking lot and back downhill to reach the marked trailhead at 5240 ft, near another large parking lot just after the road crosses a stone bridge. Follow 4th Crossing Trail to a right on Skyline Trail to Paradise Glacier Trail to reach the basin below the current glacier terminus. The Paradise Valley Road is not plowed in winter, but is a popular marked ski route to access Mazama Ridge and other areas. The best map of the area is Green Trails 270S Paradise, which shows the trails and marked winter ski routes. According to their website, there is a new 2011 edition of this map, although I've only seen the 2002 edition in stores so far. Amar-- Thank you so much for sharing your 10yrs of tay-anniversary with us on that day. As always, it was a pleasure to get out with you. Congratulations Amar.� Your trip reports are always inspiring and informative.� Thank you very much to the contributions that you continue to make to our sport. Cool dual TR and congrats!